In 1899, the Middletown Plate Company became part of the International Silver Company. The Middletown Plate Co. trademark was used by International Silver until 1921. Middletown Plate Company’s secondary trademark, Superior Silver Co., was used on a less expensive line by Wilcox Silver Plate Co., until 1941. Middletown Plate Company. (1864-80). Card receiver. Quadruple silver plate. (Accession no. 1988-22-2. Viewed 18 October 2018. J00217). Middletown Plate Company. (1864-97). Compote. Silver or silver plate. (Cat. no. 88.32.30. Viewed 18 July 2018. G02930-31). Middletown Plate Company. (1864-98). Dish on stand. (Object ID no. H.6200.684. Viewed 25 July 2018. C00138). Click the following link to see the parallel webpage - Middletown Plate Company design catalogues and historical documentation. Middletown Plate Co. (c. 1870). Tea urn. Metal, wood. (Cat. no. 2007.05.01.av. Viewed 3 July 2018. G02212-13). Boston and Sandwich Glass Company and Middletown Plate Co. (1870-87). Vase, in silver-plated holder. Glass, silver plate. (Cat. no. 2014.1.130a-b. Viewed 3 July 2018. G02170). Middletown Plate Company. (1870-90). Flagon and two chalices. Silver. (Object nos. H 35294-96. Viewed 30 June 2018. A03024-26). Middletown Plate Company. (1880). Tapered vase and mount. Silver plate, glass. (Accession no. G2012.40.203 A-B. Viewed 17 August 2018. L00565-07). Middletown Plate Company. (c. 1888). Basket. Silver or silver plate. (Cat. ID no. 78.7.2. Viewed 25 July 2018. C00136). Photo - Tennessee State Library & Archives, Nashville. Middletown Plate Company. (1890-1910). Tureen. Silver plate. (Cat. no. P81.236. Viewed 26 August 2018. J00155-57). Middletown Plate Company. (1892?). Coffee urn. Silver plate. (Cat. no. 1993.138.0002. Viewed 18 July 2018. G02932-33). Middletown Plate Company. (1894). Commemorative tray. Silver or silver plate. (Cat. ID no. 2016.75.1. Viewed 25 July 2018. C00135). Middletown Plate Company. (undated). (c. 1895). Three candlestick holders. [Accession no. 2016.2.116.1(-.3). Viewed 17 August 2018. L00563-19(-21); L00564]. Middletown Plate Company became part of the International Silver Company in 1899. After this date, it is assumed that any design patents utilized by the Middletown Plate Company division or brand were assigned to the International Silver Company. (See the ISC historical documentation page). Possibly Superior Silver Co. / Middletown Plate Co. or Wilcox Silver Plate Co. / (ISC) (see introduction above.) (c. 1900-40). 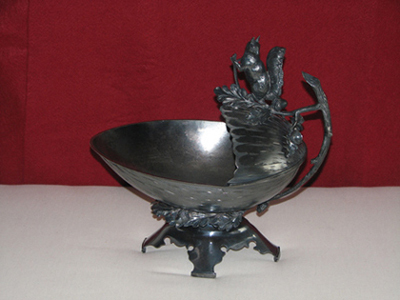 Decorative bowl. (Cat. no. UB-01350. Viewed 14 July 2018. G02727). Photo - Bjerkebæk, Sigrid Undsets hjem, Lillehammer Museum, Norway. Middletown Plate Company / ISC. (1904). Bride’s basket. Silver or silver plate. (Object ID no. H.1215.23. Viewed 25 July 2018. C00137). New York Historical Society, New York (Candlestick holder - 1; 2). Middletown Plate Company / (ISC). (c. 1915). Covered serving dish. Silver plate. (Cat. no. 7202. Viewed 17 July 2018. G02886). Glendora Historical Society, Glendora, California. Offline - Middletown Historical Society, Middletown, CT (see photo below). Middletown Plate Company. (undated). Fruit dish and stand. Silver plate, glass. (Cat. no. X1956.146.1a-b. Viewed 11 July 2018. G02537-38). Middletown Plate Company. (undated). Cruet stand. Silver plate, glass. (Cat. no. 2011.032.0007.A. Viewed 14 July 2018. G02715-16). Photo - Aurora History Museum, Aurora, Colorado. Presumably Middletown Plate Company. (undated). Tray. (object ID no. 79.158.81. Viewed 25 July 2018. C00139). Middletown Plate Co. (c. 1882). Unofficial 1882 Blue-Riband trophy for the S.S. Alaska. (Viewed 2 July 2018. G02109). Christie’s London - Maritime (13 MAY 1999). Photo - Christie’s New York - Important American furniture, silver, prints and folk art (29 MAY 2002). Christie’s - Silver (3 DEC 1996). Photo - Bonhams Los Angeles - Sunset estate auction - including the estate of Fred MacMurray and June Haver (9-10 APR 2006). Photo - Bonhams San Francisco - SOMA estate auction (17-18 APR 2011). Photo - Christie’s New York - Christie’s Interiors (31 AUG - 1 SEP 2010). Middletown Plate Co. (undated). Tazza. Silver plate. (Viewed 2 July 2018. G02107). Christie’s New York - The aesthetic interior (13 MAR 2001). Photo - Bonhams San Francisco - Period art & design (20-21 NOV 2011). Photo - Bonhams New York - The Severin Wunderman Collection (6 MAY 2009). Photo - Bonhams Knowle (UK) - Antique & Modern silver, including vesta cases (17 MAR 2010). Bonhams San Francisco - SOMA sale (21 NOV 2004). Middletown Plate Company. (undated). Nut bowl. Silver plate. (Viewed 2 July 2018. G02113). 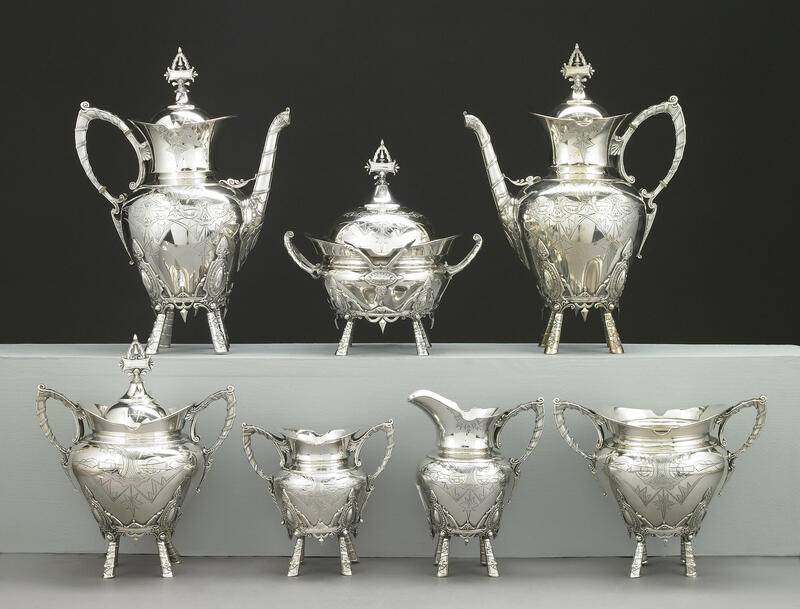 Christie’s New York - Silver (20 OCT 1993). For documentation online, see the Design Meriden - Middletown Plate Co. design catalogues and historical information page. 1 October 1880 - 30 April 1881. Melbourne International Exhibition, Australia. Online - Courtesy State Library Victoria, Australia. c. 15 - 26 January 1894. Y.M.C.A. fair, Middletown, CT.
On Middletown Plate - 1: designs in collections, etc. | 2: design catalogues, etc.